Mrs. Britts Oregon Kitchen is now River's Edge Gourmet Foods. 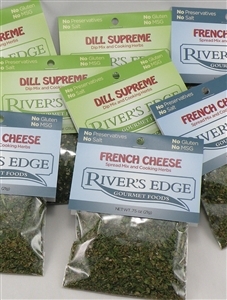 A tasty dill blend with garlic and onion and a wonderful French cheese herb blend. Three soy candles - 30 hours/candle A spunky spinach dip with an attitude. A tasty dill blend with garlic and onion Make a fast and fresh tasting salsa filled with the flavors of cilantro, cumin and peppers. A great combination pack of eight different dip mixes and herb blends. Enjoy the taste of fig with the spice of jalapeno.